Megafires appear to be breaking out everywhere, from Provence to Greece, Mongolia and the Russian Far East to New South Wales and San Diego. 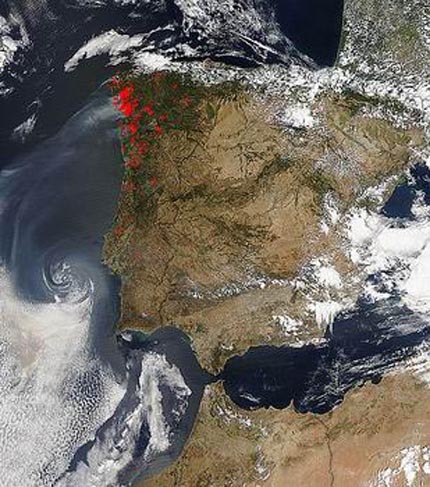 But hectare for hectare, the most explosive fire scene on Earth belongs to Iberia, specifically Portugal and Galicia. In recent years most of northern Portugal has burned over. The 2006 fires not only surrounded Coimbra, the ancient university town, but burned every pocket of parkland within it. Portugal? This is a long way from the heartland of wildland fire management. But the distance is not simply one of geography: the wildfires roaring over the Tras o Montes are as remote from the premises of fire ecology as they are from the Northern Rockies. The fires, and the reasons behind them, have nothing to do with wilderness. They are the result of a massive breakdown in traditional agriculture that accompanied the collapse of the Salazar dictatorship, accession into the European Union, and contact with the global economy. Close cultivation had kept fires under control. That unraveled when the rural population flocked to Oporto and Lisbon or other metropoli. The vegetation became rank; hedgerows dispersed, and swollen plantations of eucalypts replaced the tight mosaic of ager, saltus, and silva that had defined the landscape since Roman times. As people moved out, fires moved in. Flames no longer confined themselves to prunings in the European orchard. The Garden itself burned. Manipulating vegetation is the fourth strategy for fire management. It is the classic European treatment of choice and has reappeared as an option in wildlands and the I-zone, or exurban fringe that characterizes industrial nations. For the former, it refers to strategies for "thinning" or otherwise rearranging vegetation so that the combustibility of the landscape is more acceptable regardless of whether the resulting fire is wild or prescribed. In the latter case, the rural landscape is not deserted but repopulated with exurbanites. Without further cultivation that scene may burn ferociously. This strategy slams hard into the desire to leave wildlands wild. In the so-called intermix landscapes, the question of manipulation will be set by esthetics, and very little of the scene will not be the direct result of human fiddling. In wildlands the option will be selective. But there are good reasons to believe that it will be necessary. Fire behaves as its setting dictates; to define that setting is to define fire. Like a reintroduced species fire requires the proper habitat if it is to survive in the forms we desire. Coimbra may not be so far from Malibu after all. ———- Steve Pyne is the author of Tending Fire: Coping with America’s Wildland Fires. He is a professor in the School of Life Sciences at Arizona State University.